Lemons and limes in the lower left. Yellow limequats and orange kumquats in the center. Satsuma and tangerine in the upper left. Cara cara and heirloom navels on the right. 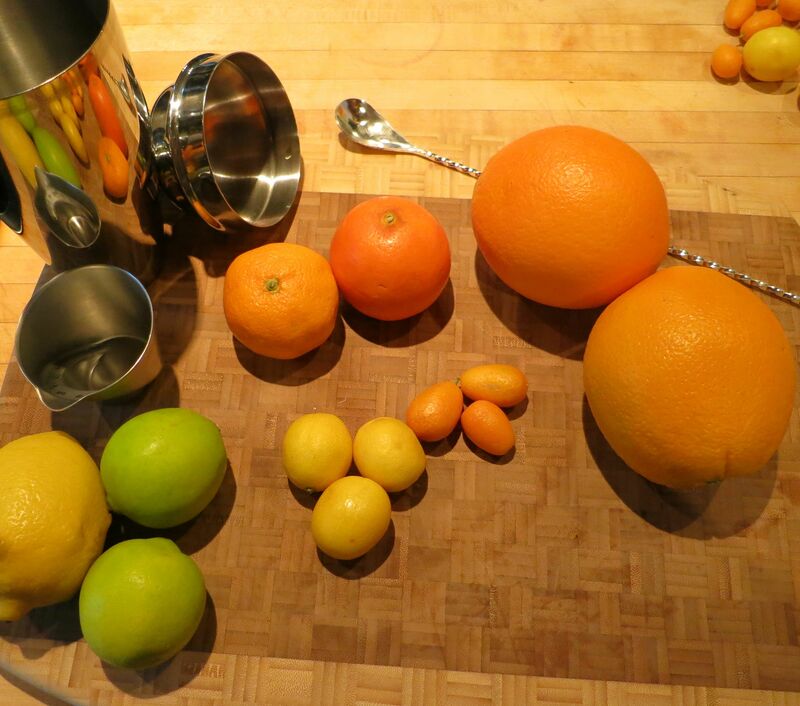 It’s a good time for citrus here in the Pacific Northwest. We typically get several orange varietals as well as tangerines, satsumas, and other similar orange-y citrus. So we decided to try a number of different ones to see how they worked in a cocktail, and determine if they can be used interchangeably or not. 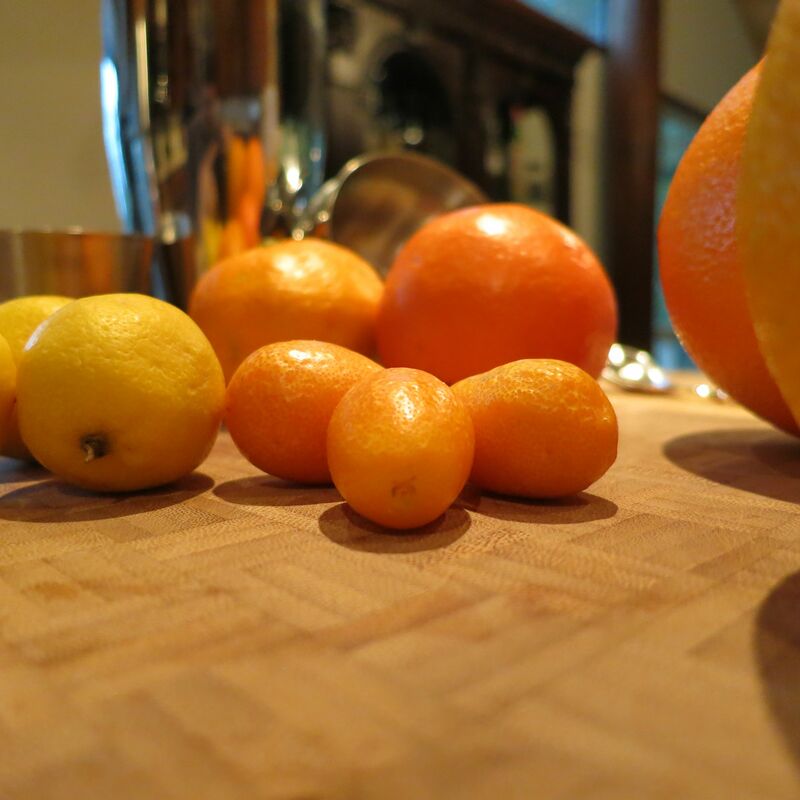 Today we’ll review kumquats, satsumas, fairchild tangerines, cara cara navel oranges, and heirloom navel oranges, ’cause they’re what was at the store today 🙂 We started off by juicing an ounce or so of each citrus and tasting it straight to get a feel for the flavor profiles. Palate: Really strong bitter lemon-orange, quite sour. Bright acid, makes the tip of your tongue tingle. Very oily from the peel. Nose: Orange, little bit of tartness. Palate: Mildly sweet, gentle acid. Tropical fruit like tangerine. Well rounded flavor. Palate: Very orange-y and tropical. Slightly higher acidity compared to the satsuma, some herbal, brine, and petrol notes as well. Has a little more complexity. Palate: Very fresh sweet orange, low acid. None of the peel flavors, but this maybe a function of how we juiced it. Palate: Less sweet, more acid than the cara cara. More savory notes, almost vegetal, but not unpleasant. Well balanced orange peel notes. Monkey Gland We decided to try the different citrus juices in a Monkey Gland, since that is a fairly simple cocktail in which orange juice plays a key role. Shake ingredients with ice, strain into a glass. Enjoy! Kumquat This one needs about 1/2 oz of added simple syrup. Nose: Anise, bitter orange, slight bitter almond. Palate: Really bitter. Needed to add some simple to make it palatable. Intense, bitter-sweet, oily lemon-orange to start. Little bit of sweet grenadine and gin on the mid-palate. Bitter, quite sour, dry finish. Not unpleasant but very intense. Mixed according to the usual proportions, the kumquat is overpowering. Could work nicely but you’d definitely need to tinker with the balance. Nose: Faint perfumey orange. More tropical than regular orange. No absinthe, grenadine or gin for Christa. Anise and black pepper for Shaun. Palate: Better balanced. Gentle sweet orange at the front, then gin (juniper and orris root), absinthe, little tiny bit of fruity tannic taste from the grenadine. Lack of acid or peel makes it a little flat. Nose: Tangerine, lime and almost a green sort of smell, like cut grass. Faint anise. Little bit of sweet almond. Palate: Gentle, sweet-tart orange to start, as well as sweet almond for Christa. Then anise and bitter, slightly grassy herbal on the mid-palate. Nice smooth round finish with more fruit (tangerine and grenadine). Better sweet-acid balance. Nose: Anise and orange juice. Fairly muted nose. Palate: Similar to the satsuma one. Not a whole lot of evidence of orange oil. Very little tartness. Allows the gin and absinthe to speak up more clearly. Little bit sweeter and more intensely flavored than the satsuma. Nose: Slightly sour orange. Little bit of grenadine, juniper, and anise. Palate: Orange to start, with more acid like the fairchild, then grenadine, absinthe and gin are nicely balanced on the mid-palate. Nice sweet spice finish, with coriander and cardamom from the gin and tingly anise from the absinthe. Best balanced of the lot. And now we give you a bonus drink 🙂 The store had limequats, which were outside of our post scope for today, but which we picked up anyway since they are delicious. The limequats are the small yellow fruit to the left. They only look big in comparison to the tiny kumquats. Shake first 3 ingredients with ice. Strain into a glass, top with club soda. Garnish with a cherry and a lemon twist. Nose: Orange blossom and jasmine. Perfumey limequat smell. Like lime, but a little fresher smelling, with more notes of juice or pulp. Palate: Floral on the front, perfumey limequat, caramel and maple. Back of the palate gives really distinct woody barrel notes. Mildly tart, dry finish with a little bit of the rye spiciness. So to sum up our findings for today. The kumquats are very interesting but intense. We’d definitely use them again, but with more tweaking to the recipe. We think they’d go nicely in tiki drinks to balance other strong flavors. The satsumas and cara caras both have good clear orange flavor, with the satsumas having more of a tropical flavor. They would both do well in drinks in which some other citrus like lemon or lime is used as well to bring an acid balance to the cocktail, as they are both somewhat lacking in that. The Fairchild tangerine and the heirloom navel both provide a good sweet-tart balance, and are well-used in cocktails where they are the primary or possibly only citrus. This entry was posted in absinthe, Cocktail Comparisons, Gin, Tasting Notes and tagged cara cara navel orange, citrus comparisons, heirloom navel orange, kumquat, monkey gland cocktail recipe, satsuma, tangerine. Bookmark the permalink.